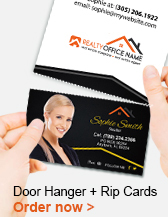 Realty Studio Design maintains all print files. If you have ordered from us in the past and wish to reorder, simply select your product below and fill out the reorder form. We match your files using your name, email address and/or order number. You can update or change any text or photos on your file, or simply reprint your original file with no changes. Note: You will receive a proof to approve before printing, just like your original order. Thank you for your re-ordering with us! Your re-order request form will be reviewed shortly and a response made to the email address or phone number given. You are very important to us; all information received will always remain confidential.